eBay have gotten on-board the whole Windows Phone 7 train, and have put out an official app, which has been shown during today’s keynote as one of the thousands of apps available at launch. Microsoft talked about the app as an example of how the developer tools can be used to make an app that fits the overall theme of the UI, so that it feels like a proper part of Windows Phone 7. SAN JOSE, Calif.–(BUSINESS WIRE)–eBay (Nasdaq:EBAY), a leader in mobile commerce and the world’s largest online marketplace, announced today the availability of its first application for Windows Phone 7, in conjunction with Microsoft’s international debut of its Windows Phone 7 devices. eBay’s app for Windows Phone 7 builds on the momentum of eBay’s expanding global reach in mobile commerce through its portfolio of multi-platform mobile applications. The eBay app for Windows Phone 7 delivers a seamless and personal shopping experience, allowing users to quickly search, bid, buy and check their eBay buying and selling activity wherever they go. The app leverages Microsoft’s panoramic user interface so that shoppers can seamlessly slide through their eBay activity. It also takes advantage of Windows Phone 7’s push notification technology so that users receive real-time alerts on great deals and best offer activity – all without leaving their home screen. 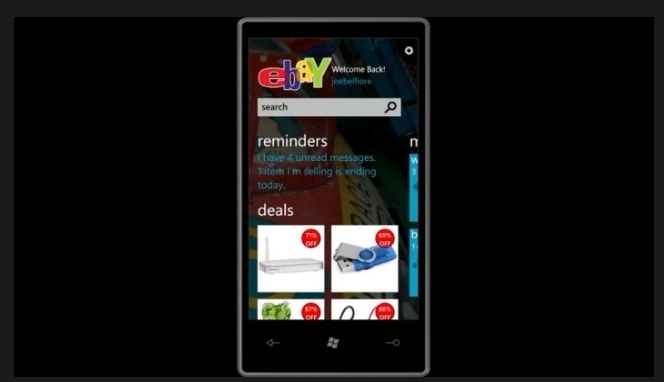 The eBay app will be available for free download to Microsoft Windows Phone 7 users across the globe. The ability to shop eBay’s 200+ million listings will be available in eight countries: Australia, Canada, France, Italy, Spain, Germany, United Kingdom and United States. As the global leader in mobile commerce, eBay recognizes that sellers and buyers are increasingly turning to mobile devices for their shopping needs. eBay’s mobile applications are available in more than 190 countries and eight languages. An item on eBay is purchased every second via mobile devices.